When Russell Colvin lost his Manchester, Vermont farm and had to move his wife Sally and their six children into her parents’ house, his in-laws treated him with utter disdain. Sally’s brothers, Jesse and Stephen Boorn, resented the new mouths to feed and taunted Russell relentlessly. Russell disappeared in 1812, after a particularly violent argument with the Bourne brothers, and rumors of foul play began to circulate in Manchester. After seven years, the rumors became accusations and the Boorn brothers were arrested, tried and convicted of killing Russell Colvin. With his execution just weeks away, nothing could save Stephen Boorn now but Russell Colvin’s return. And what were the odds of that? Russell Colvin was a man of peculiar habits. From time to time he would get up and start walking, leaving his family, sometimes for a day or two, sometimes for several months. But he would always return to his wife Sally and his six children who were living at his parents’ farm in Manchester, Vermont. Apparently wandering was a family trait because one day in 1801, Russell’s father walked out, moved to Rhode Island and never came back. Russell was considered feeble-minded by the people of Manchester, and they did not believe he was capable of running the farm by himself. The town had an obligation to protect the rights of widows so, fearing Russell would run it into the ground leaving his mother with nothing, the city fathers confiscated the Colvin farm. They leased it to tenants and used the rent to support Russell’s mother. 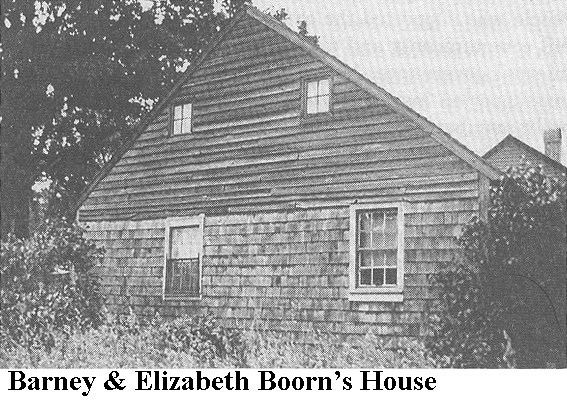 Stripped of his birthright and home, Russell was forced to move his wife and children into the home of Sally’s parents, Barney and Elizabeth Bourn. Barney’s parents, Nathanial and Freelove Boorn, had been early settlers in Manchester and, in an era when Vermont was famously wild and Godless, they helped establish a Baptist church there. The righteousness of Nathanial and Freelove did not pass on to their offspring. The Boorn family was in decline with three of their grandchildren—Sally, Stephen, and Jesse—taking up the rough and rowdy ways of old Vermont. The Boorn boys were wild and reckless. Stephen was described as “malicious, passionate, and when angry, blind to consequences” and Jesse tended to follow his older brother’s lead. Sally was tough, willful and disrespectful of conventions— “one of the devil’s unaccountables,” Stephen called her. She shared her husband’s wanderlust, taking off alone when the mood struck her. And she seemed to be perpetually pregnant. What happened next is uncertain. Russell disappeared, and at least at first, those who knew him believed that he had simply wandered off again. But he had never before left without telling anyone, and he had never been gone longer than nine months. As months turned into years, suspicion of foul play began to grow. Sally continued her own wanderings and after one trip in 1815 she came home pregnant. Under Vermont law, an unwed mother could “swear the child” – name the father and compel him to provide child support. But Sally could not swear her child because, in the eyes of the law, her husband was still alive. Sally later testified that when she told this to her brothers, Stephen said that she could go ahead and swear the child, for Russell was dead and he knew it. 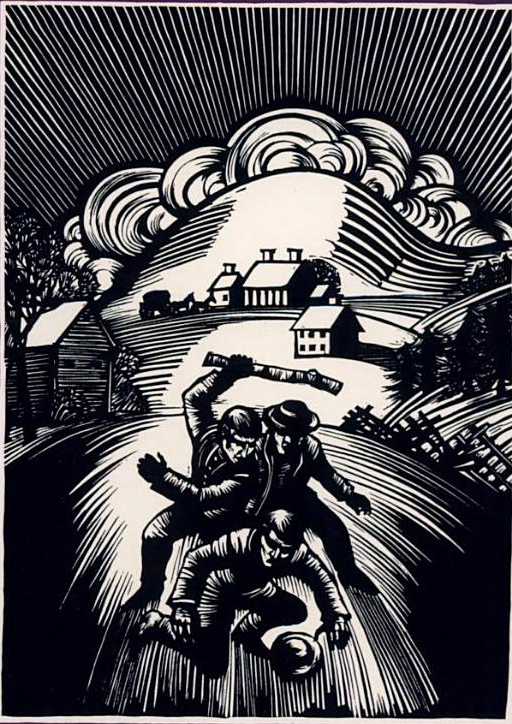 Another time Lewis asked what had become of his father and Jesse replied that they had “put him where potatoes wouldn’t freeze” – referring to a root cellar dug below the frost line for storing vegetables. In spring of 1815 some children found Russell Colvin’s slouch hat. His sister commented that Russell would never go about without his hat. In 1819, seven years after Russell’s disappearance, suspicions were forced out into the open when Amos Boorn, the siblings’ uncle, revealed a dream he had in which he was visited by the ghost of Russell Colvin. The ghost stood by the side of his bed and told Amos that he had been murdered. Then he led Amos to his gravesite, an old cellar hole in a field that had once belonged to Barney Boorn. When this news came out, other Manchester residents were visited by Russell’s ghost. A court of inquiry was formed and Jesse Boorn was arrested. Stephen would have been arrested as well but he had long since moved to Denmark, New York. The cellar was dug up revealing a coat button and a jackknife which were both identified by Sally as belonging to Russell. Beyond this, the court had very little evidence to hold Jesse. They pressured him to confess but he would not. Finally, a neighbor, Thomas Johnson, who had witnessed the argument on May 10, 1812, spoke with Jesse alone. Jesse came out of the meeting ready to talk. He said he believed that his brother Stephen had killed Russell and he could tell them, “within a few rods,” where the body was buried. This set off a frantic search that resulted in the discovery of a few charred bone fragments and a toenail near an old tree stump. A posse was sent to Denmark, New York and Stephen was brought back to Manchester and was charged with murder. Meanwhile in Manchester’s jail, Jesse told the whole story to his cellmate, Silas Merrill. He said that Stephen had clubbed Russell Colvin to the ground during an argument. They buried the body in the cellar hole, then a few years later dug up the remains and reburied them under a nearby sheep barn. When the barn burned down they moved the charred remains again, to the tree stump. Merrill related this story to the authorities and was set free. Jesse had tried to save his own life by placing the blame on Stephen who he believed was safe in New York. When he learned that Stephen had been arrested, he recanted saying the confession had been false. The State’s Attorney ignored the recantation. 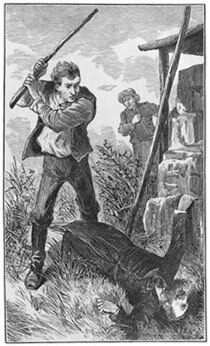 With more witnesses coming forward to swear they had heard Stephen and Jesse threaten Russell’s life he felt he had a solid case against the Boorns. Now in custody, Stephen Boorn also confessed, but claimed that he acted in self-defense. This claim was largely dismissed since, from the precise language and emphasis on mitigation of the crime, the confession was believed to have been written by Stephen’s attorney. The Boorn brothers would be tried for murder. The court’s biggest problem in the trial of Stephen and Jesse Boorn was finding a jury of twelve men who were not already convinced of the Boorn brothers’ guilt. The principal evidence against them were the confessions, backed by eye witness accounts of the argument from Thomas Johnson, Lewis Colvin, and others. Contrary to popular belief, Amos Boorn’s dream was never entered into evidence. The jury had little trouble returning a verdict of guilty. 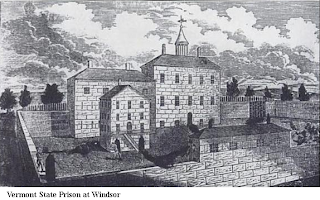 Both of the brothers were sentenced to death, but Jesse, who appeared less culpable, had his sentence reduced to life in the Vermont State Prison. As the date of his execution approached, Stephen suggested that an advertisement be placed in the newspapers asking for information on the whereabouts of Russell Colvin who Stephen asserted was still alive. His lawyers thought it was futile but agreed to place the ad for him. Around the same time an item appeared in the New York Evening Post, describing the Colvin murder and marveling at the divine intervention (Uncle Amos’s dream) that revealed the killers. The next day the article was being discussed by a group of men in a New York City hotel, including James Whelpley, a former resident of Manchester, and Tabor Chadwick, a Methodist preacher from Shrewsbury, New Jersey. Whelpley knew personally all of the players in the story of Russell Colvin’s death and he related the details. 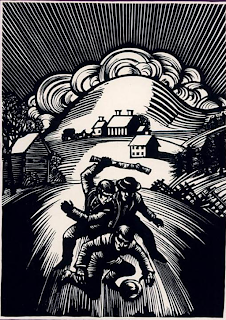 Thinking about what he had heard that day, Chadwick later remembered that he knew a man, a farmhand in Dover, New Jersey, by the name of Russell Colvin who had often spoken of Vermont. Chadwick sent a letter the New York Evening Post claiming that he believed Russell Colvin was still alive. James Whelpley read the letter and went to Dover to see for himself. The farmhand was “partially deranged” and now went by another name. He denied being Russell Colvin but his responses to questions about Manchester, Vermont convinced Whelpley that he was the man. Reluctantly the farmhand agreed to accompany Whelpley back to Vermont. In Manchester they were greeted by a large, curious crowd. The man astounded the citizen of Manchester by recognizing old friends and neighbors and calling them by name. He was able to identify places and buildings and relate their history. He was taken to the jail and Stephen Boorn was brought out to meet him. “What is that for?” Russell asked staring at Stephen’s chains. “Because they say I murdered you.” Stephen replied. “You never hurt me.” Russell said. In the end there was universal agreement that this man was Russell Colvin returned. He testified in a court of inquiry then went back to New Jersey. The defense attorneys petitioned for a new trial, the petition was granted, the prosecution responded nolle prosequi indicating they would not prosecute. Stephen and Jesse Boorn were free men. The Boorn-Colvin case became the subject of sermons, lectures, and articles examining the religious, legal, and philosophical implications of false accusations, coerced confessions, the power of gossip, and belief in the supernatural. The case was invoked by defense attorneys throughout the century to warn juries of the danger of convicting a man on circumstantial evidence alone. This case has one more twist. Stephen left Manchester as soon as he could and moved to Ohio where he built a farm and raised a family. Jesse did a considerable amount of travelling but eventually ended up in Ohio as well but with a less respectable occupation. Going by the name Jesse Bowen, he was a counterfeiter associated with a counterfeiting ring in Cleveland that was particularly good at eluding capture. In 1860 he met a man named Hackett who claimed to be a counterfeiter and asked Jesse for an introduction to the ring. Jesse denied involvement at first but eventually trusted Hackett and admitted he was a counterfeiter. He also admitted that he and his brother had killed a man, but were released from jail when an imposter that they had hired to play the dead man, convinced the town that he had never died. Hackett was actually a Federal Marshall and Jesse was arrested and spent four years in prison. 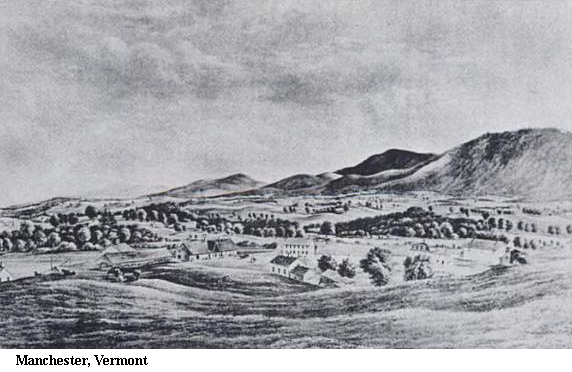 The story of the imposter was published and made its way back to Vermont, but Manchester residents gave it no credence. Old-timers who had seen the resurrected Russell Colvin were brought out to swear again that he was the right man. Having been hoodwinked once, they were not anxious to have it happen a second time. 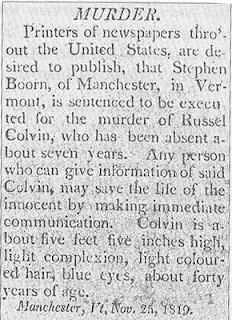 Most modern commentators believe that it really was Russell Colvin who returned from New Jersey to Vermont and that the original Boorn convictions were in error. However, in his 1993 book, The Counterfeit Man, Gerald McFarland makes a believable case that the Boorn family had perpetrated an elaborate hoax. McFarland, Gerald W. The "Counterfeit" Man: The True Story of the Boorn-Colvin Murder Case . Amherst: University of Massachusetts, 1993. Spargo, John. The return of Russell Colvin;: A full and veracious account of ... how Stephen and Jesse ... were ... sentenced to die ... for the wilful murder of Russell ... was proved that Colvin had not been murdered . Bennington Historical Museum & Art Gallery, 1945. Collins, Wilkie. The Dead Alive . Shepard and Gill, 1874. I enjoy your blog so much, I follow and added it to my Favourite Blogs on http://historyandwomen.blogspot.com. Visually beautiful and fascinating too. Thank you, Mirella, I really appreciate your support. You have some remarkable women on your blog. Naturally I went straight to the murderesses. Nice to see Lizzie Borden in such illustrious company. You definitely belong on our blogroll. This story was retold by the radio show 'Crime Classics' in the 1950s. When is the podcast for Murder by Gaslight coming? Would love to hear it. Jack the Ripper in America?